i wouldnt trust this board 😀 guess it breaks at the first curb …. Hi Guys – it was actually me who did the crafting – Sam Abbot did the CAD work – would you be able to credit it correctly? Why? 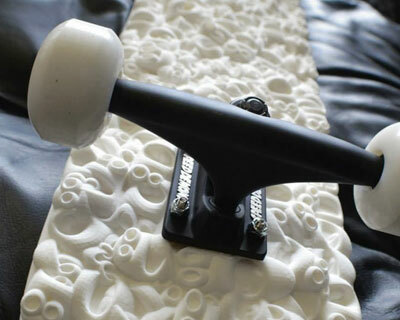 Its not really a skateboard if you cant ollie without it breaking. Im getting really tired of this “oh em gee its three d printed” attitude. If its the appropriate medium then so be it. 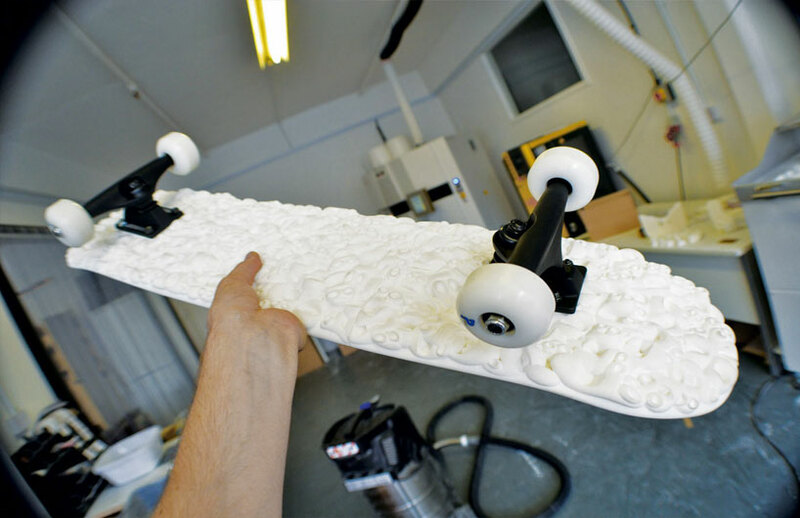 But really a 3d printed skateboard? My complaint with designers who make “art” or “pieces designed to encourage a conversation” is that its the easy way out. A lot less thought blood sweat and tears. Design has the potential to change the world for the better. It would be nice to see young designers dig in and get to it. I’m so with you there, Justin, But as Nick also points out, it’s mostly the journalists and blogs, who’s gone all 3D print dizzy. We’re still pretty far from the personal factory. thank you for the clarification, nick! we’ve amended our article. Nobody who skates calls it a twin tip. Skateboards are and have been part of pop culture for some time so those in the know have to deal with it. Yeah, that thing is probably heavy and weak but it’s a new twist on a pop culture icon. This is awesome! Great work Nick it came out really well! Im the 3D Print designer that created this file! I think the internet has got the wrong idea behind this 3D Print. 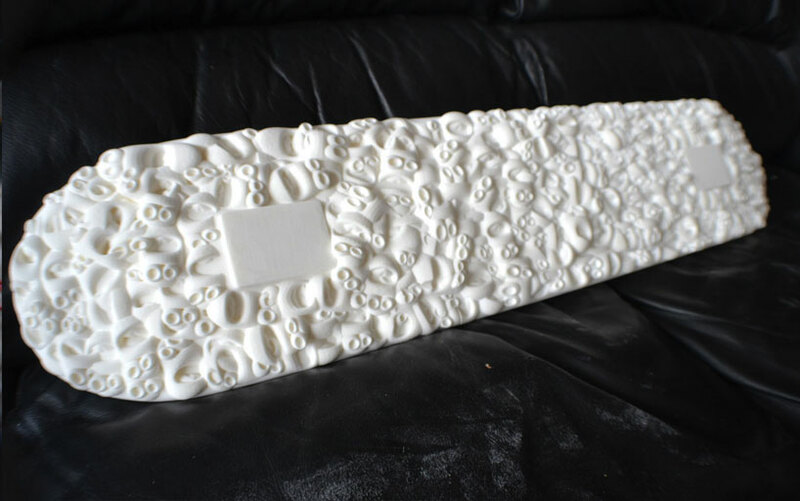 It was a competition I won and as a prize I was awarded one of my designs to be printed by 3DPrintUK for myself. The file is currently too large for most 3D printers as so was dissected into 3 part then assembled. Greatly reducing its strength. The deck was never created for commercial purposes. It is a first print prototype in plastic of my file for me and my portfolio. Hopefully in the future printing cost will reduce and variety in materials will increase so that files like this might stand a chance for commercial use. But for the moment this file for me and any one who’s interested in the possibilities of 3D printing. I am very happy and excited it has received so much attention just thought I would inform everyone what this 3D Printable file was intended for! This is a wonderful example of function following form, except it does not function. It has the form of a skateboard but is too weak to function as one, therefore is not a skateboard. Sam did not actually make the object but takes credit for creating it as a computer file that won a contest. Nick takes credit for making it presumably because he ran the machine using Sam’s code. So, is it a program, a prize, a machine product, a prototype, or something for a portfolio? No one knows, so, let’s call it ART. Fantastic ! This is a great design study for the next step. 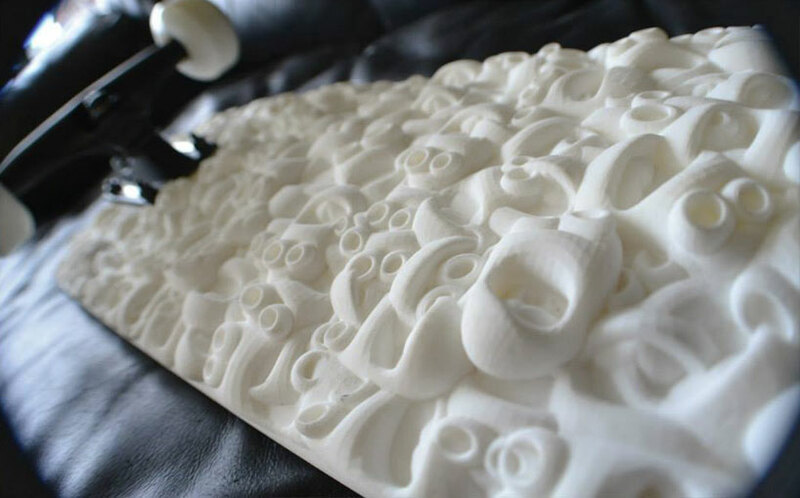 Some of the commenters don’t understand art, design and product development and how the 3D printer allows for more full-scale form studies …Wow nice work! Fully functioning? 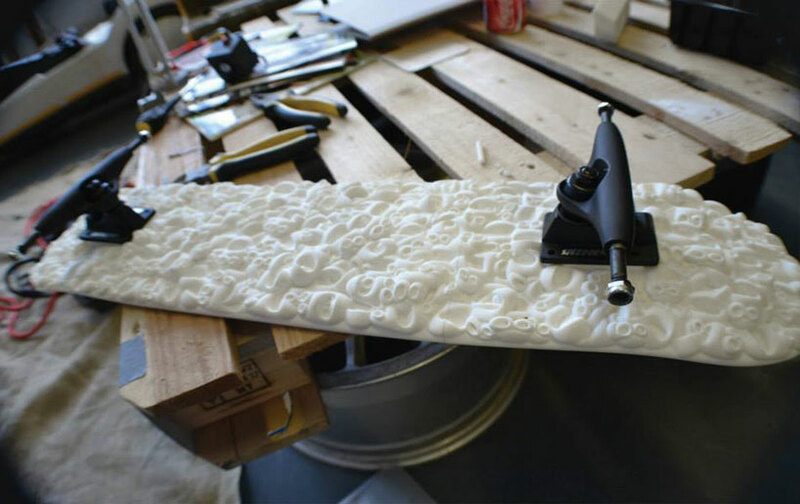 I dont think so… The design is cool and would probably make any surface or object so, if applied to it, but it is not a skateboard unless you can use it as it has been pointed out already. 3D printing is great, but in this instance they might have as printed out a plastic Big Mac and fries. 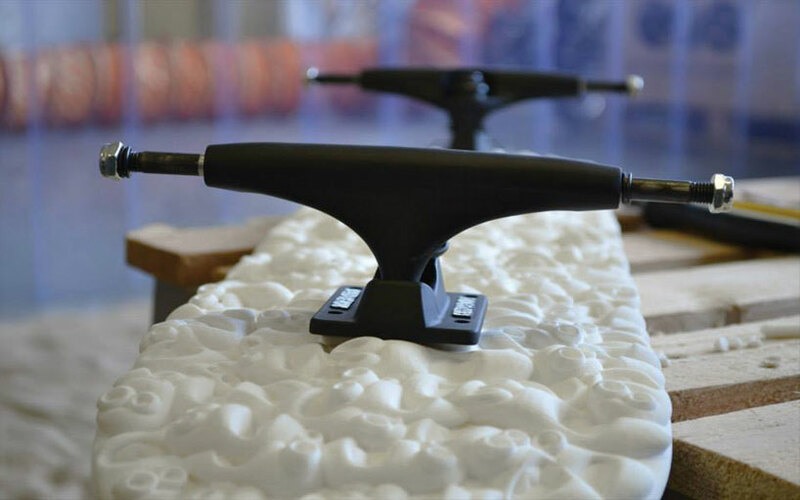 In my humble opinion, 3d printing is great when it challenge by itself the way things are produced now, and sorry to say it but… There is no challenge here, this can also be donde in another material,, cheaper, faster and maybe even more functional, therefore I think at if the skateboard would be done in one piece omitting or including al the mechanical pieces, the project would stand by itself with a stronger argument on the benefits the 3d printing can bring to the way thing can be made in the future.